Good morning everybody! It's that time to announce the latest episode of the Nosh Show starring myself, Eric from junkfoodguy.com, Marvo from theimpulsivebuy.com, and Ryan from grubgrade.com. Now as a warning, I may or may not ramble inexplicably several times during the episode, but let's hit a few visual highlights here. 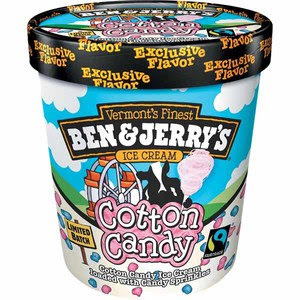 My favorite Nosh or Not of the episode has to be the new Ben & Jerry's Cotton Candy Ice Cream. It's Cotton Candy Ice Cream loaded with Candy Sprinkles. Now my daughter has ordered cotton candy ice cream from several scoop shops and it's always the same brightly colored, over sugared, kid focused treat you find at every other place. I'm thinking (hoping) that Ben & Jerry's is going to attack it from a bit more adult perspective while still trying to retain that whimsical silliness that appeals to our inner child. Or maybe I just think it's funny that a cow is holding cotton candy. Will you grab a pint when it comes exclusively to your local Walmart? I did finally, see my review here. For our followup segment, I babble about Hershey's Cookies 'n Cream cereal, watermelon Oreos, and the new Pretzel Burger from Wendy's. Despite my last run in with pretzel buns being a failure, this burger works and I look forward to getting it again. There's no one flavor sticking out, it just came together nicely, though I think there was some small part of me that missed ketchup on it.... or maybe I was just bummed that I got the sandwich and not the combo meal. 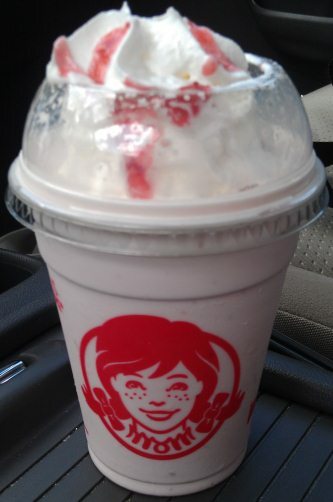 Now I didn't get this with my pretzel burger, but I stopped at Wendy's with my daughter a few weeks ago and realized that I had never actually tried their version of a strawberry shake. It was pretty good, no major complaints though a McDonald's Strawberry shake has a sweeter, more realistic flavoring and is a little easier to drink. Disclaimer: I can't go without explaining my "whole foods rant" during the show. See, my son drinks oat milk, a product that is very hard to find. I can -sometimes- find it at Stop & Shop, usually for $3.99, or I can go to Whole Foods and pick it up for $2.99 a quart. Now I use to go to a Whole Foods out west, and the employees tend to be friendly, and they would encourage me to buy 12 quarts so that I would get the 10% case discount.... and then I started going to a Whole Foods closer to Boston. I can't tell you how often the cashiers were rude to me because I didn't buy a literal case. "You need to ask someone to get you a case from the back" they would say. Look, I have asked on multiple occasions and not once has an employee been able to find me a case of this stuff in the back. I've has cashiers deny me the 12count discount on several occasion. "If there aren't any cases in the back, you need to ask customer service to order some" they would say. Once, this helpful guy couldn't find a case, so he brought me a similar box, put the 12 quarts in the box and sent me on my way... only for the cashier to torment me for using the wrong box. So yeah, I have a problem with people's attitudes at this particular Whole Foods. Keep in mind that I'm buying a case of this stuff every two weeks, which means I literally have to risk the wrath of a cashier twice a month. Is it any surprise that I'm bitter? So I gave up really. It has come to the point where I will patiently stand at the customer service desk behind the lady angry that she paid 89 cents and not 87 cents for her bananas, nicely place my order for 2 or 3 cases of oat milk, give them my cell phone number, leave, wait a few days hoping for their call back, go back a second time, wait in the customer service line again, tell them why I am there, wait for them to go in the back, tell them to look again because they can't find it, finally get my milk, go wait in line, debate with the cashier whether she should scan the box or have me take one of the quarts out, and then finally leave. This store makes my life way too difficult. I love my son, I will do this for my son, but it does not mean I have to enjoy a single moment of the experience. 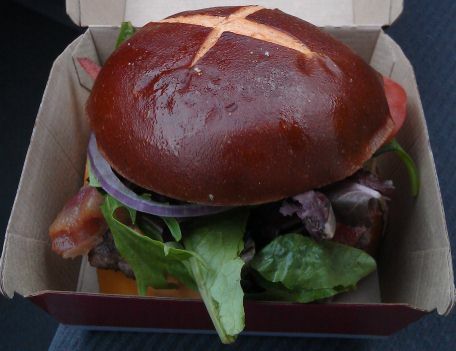 I tried the Wendy's burger Sat night and loved it! Can't wait to try the cotton candy! And I hear you on Whole Foods, the ones where I live are always a zoo even in the middle of a weekday. I can't imagine going through that every few weeks! hehehehe, thanks! I've seen a similar recipe before... or maybe it was that recipe. I just cant imagine doing this everyday, but I should try it!